Depending on the type of thinking we use towards problems we deal with, we are going to get different types of solutions for those problems. Most people in the world use this kind of thinking. It's thinking on a hunch. A random approach to working things out. Based on ad hoc emotions, events, personal insight and experience and little to no structure. People using this type of thinking are likely to have scattered values, frames of mind and understanding of the world. Their 'gut feel' isn't tuned to prioritise things and apply weightings to what matters and how it related to each other. Outcome of this thinking are disparate results, all dependent on circumstances. Many people have some sort of business thinking in themselves. This can be very simplistic to highly sophisticated. Business Thinking is about making profits, cash, turnover and winning customers. It focuses heavily on money as the core measure of success. I leads with profits, monetary success and sees economy as a monetary matter. Most management science talks about business thinking. Business thinking is heavily reductive in nature. It looks to simplify the world into monetarily quantifiable values. It looks to turn everything into a monetary unit of measure. If something isn't measurable as a monetary value, it has little to no relevance to business. One could argue that Business Thinking has ruined our planet over last 100 years or so. Science looks to understand matters in much more detailed way. It is often rooted in materialism and 'atomism'. It values physically observable things more than anything else. It looks to reduce everything to physical reality and disregards that which doesn't 'reside' there. It sees more than money as the significant matter, but doesn't accept the 'unexplainable' as real. We are now in the realm of applying science to making products. Creating machines which leverage the power of scientific thinking to mechanics. Most engineered things tend to solve individual problems. Specific tasks that 'sit' in distinct realms of practical purpose. Engineers rarely think in context of broader system. Almost never in context of the ecosystem. Engineering tends to disregard nature unless it has direct relevance to the engineered object. For example, a solar power cell must consider natural conditions to work at all. This is when Engineering Thinking 'cares' about nature. Otherwise, it tends to ignore it. Human nature too for much of the time. The focus is the mechanical creation, rather than the broader context it exists in. In Systems Thinking people start taking into account much broader context. How something will work in context of longer term use. How it will evolve depending on various conditions that act upon the system. Systems can be very complex in nature. Made up of many, many components and often include people are 'building blocks'. We get into the unpredictable human nature and dynamics of changing behaviours. Systems Thinkers must take many, many mechanical, architectural and social factors into account. Systems often develop and evolve over a long period of time, so strategic thinking is an important part of this too. In Design Thinking we start recognising the importance of ever evolving human psychology much more. The fact that humans do not use things which work. They use things that feel great and work. To make products and systems that feel great we must venture into the fluffy realm of Experience Design. Experience is the ultimate product here. People want to use those things that make them feel more powerful. Those things that enable them to live a more meaningful and fulfilled lives. Design Thinkers design solutions which are for people, to give them superpowers. Whether it is to make life more enjoyable, achieve more in faster way, save time or simplify processes. It all needs to be experientially attractive and appealing. The right feeling is the goal, while keeping broader context in mind. 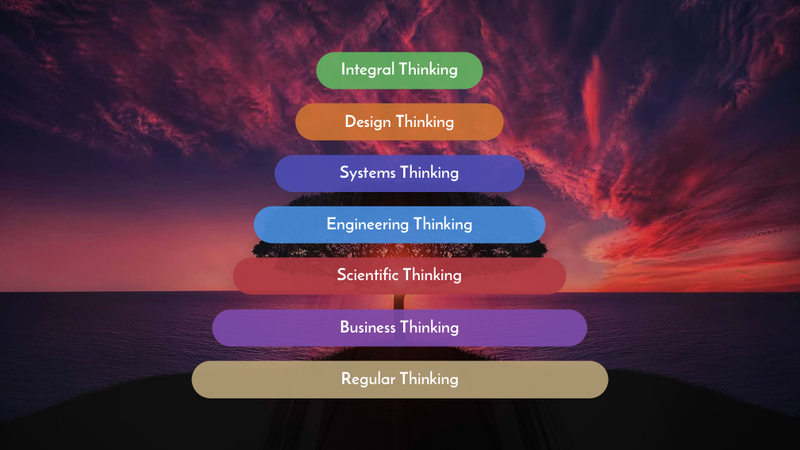 Integral Thinkers start to take the full picture into account. They start admitting that the nature of existence very complex. More than any previous thinking types allow themselves to take into scope. Integral Thinking takes evolution into account not only as a theory. It 'bakes it in' as a practical process that works on everything all the time. So, to deal with complexity, in Integral Thinking we must go back to the first principles. The origins of everything and work up from the beginning. This kind of an approach ensures we can integrate our creations with nature. Not fight the nature and oppress it, but work with it and leverage it. It's looking at the planet as a platform, not a place to exploit from. 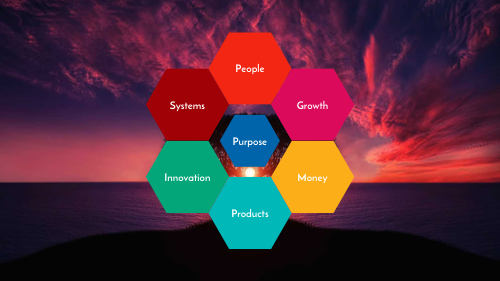 So the approach of planet, purpose, people, products, profits gets adopted as the right approach. Integral Thinking has another important aspect to it. It recognises that humans evolve faster and faster all the time. As such, it sees the product of its own design process as future humans. Helping humans transform themselves to embrace their own integral nature. Humans want to achieve unification back with the source of existence. That requires total understanding of the nature of existence. It requires humans embracing their own divine origin and merging with it to become their full selves. Integral Thinking has equal respect towards science and towards spirituality. It all makes sense in its own way. As Integral Thinkers we can become designers of our own future.